If you need extra cash this winter, look no further then Cash4Books! We’re committed to making 2016 the best year yet with our tips to beat the winter weather blues and an amazing list of books to read. Now, the ultimate list of tips to fill your wallet. Whether it’s snowing several feet or raining cats and dogs, there are simple tasks that can make you extra cash. Talk to your neighbors or local businesses about shoveling their walkways. Alternately, offer to clean out their gutters and drain pipes if the rain keeps coming. These vital tasks are important and worth some good cash! If you find yourself keeping the heat on high, try turning it down a few notches. This immediately cuts your electricity or gas bill. If you’re feeling chilly, wear more soft and cozy layers, snuggle up in a good blanket, and expand your tea, coffee, or cocoa selection. Warm drinks help keep you cozy and warm without adding to your heating bill. Your winter wardrobe is in full use, but if you find there are certain sweaters, coats, or pants you aren’t using, consider taking them to a local thrift store or selling them online with sites like Poshmark. Consider going through your summer wardrobe as well. If you find things you didn’t wear last summer, get rid of them! If you didn’t wear them before, you probably won’t wear them later. Another avenue to winter cash is through babysitting or becoming a nanny. If you have previous experience watching kids, reach out for a recommendation. Put up flyers in your local university center and tell your friends and professors you’re looking for a position. Professors often have children or know someone who needs childcare help. Additionally, you can consider signing up for services such as care.com to help you find positions. Another way to snag winter cash is by selling your old textbooks. If you’re still holding on to books from last semester or the year before, sell ‘em! They could be worth a decent amount of cash, and you really don’t need them anymore. With so much accessible information on the Internet, holding onto textbooks isn’t necessary. Input your textbook ISBNs on our homepage and find out how much cash they’re worth. Get to it! If you have a creative hobby like knitting or crocheting, consider putting it to use at your local craft fair. Get some cheap yarn and knit scarves to sell for a profit. There are countless unconventional methods to earn some extra cash, and using your hobbies and unconventional skills is a great tactic. One classic method for finding quick cash is recycling. Gather empty soda cans and bottles from around your college campus or nearby neighborhood, and turn those into cold, hard cash. Many people don’t take the time to recycle their cans and bottles themselves, but each one is worth 5 to 10 cents. That definitely starts to add up! 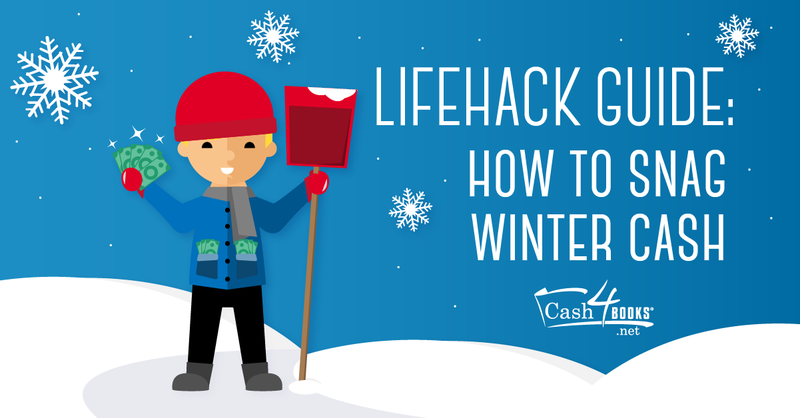 With all these tips, your wallet should be nice and full this winter. Now get out there and make some cash!